大鼠 IGF1 ELISA Kit | ABIN3032869 Product No. Microplate: 96 breakable wells (12strips x 8wells) coated with anti-rat IGF-1. 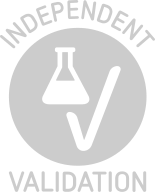 Standards: 2 vials, recombinant rat IGF-1. 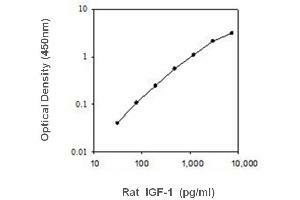 Detection Antibody: 2 vials, biotinylated anti-rat IGF-1. Standard: Briefly spin standard vial before use. Add 200 μL 1x Assay Diluent to prepare a 50 ng/mL standard. Gently vortex to mix. Take 75 μL standard into a tube, then add 425 μL 1x Assay Diluent to prepare a 7500 pg/mL stock standard solution. Add 300 μL 1x Assay Diluent to 7 tubes. Label as 3000pg/mL, 1200pg/mL, 480pg/mL, 192pg/mL, 76.8pg/mL, 30.7pg/mL and the last tube with 1x assay diluent is the blank as 0pg/mL. Perform serial dilutions by adding 200 μL of each standard to the next tube and vortexing between each transfer. Streptavidin-HRP: Briefly spin the HRP-Streptavidin concentrate vial and pipette up and down to mix gently before use. HRP-Streptavidin concentrate should be diluted 200-fold with 1X Assay Diluent. Sample: Levels of the target protein may vary among different specimens. Optimal dilution factors for each sample must be determined by the investigator, the recommended dilution for serum and plasma is 1: 500-1000. 样品收集 Serum: Use a serum separator tube (SST) and allow samples to clot for two hours at room temperature or overnight at 4 °C before centrifugation for 15 minutes at 1000 x g. Remove serum and assay immediately or aliquot and store samples at -20 °C or -80 °C. Avoid repeated freeze-thaw cycles. 储存方法 4°C/-20°C,May be stored at 2-8°C for up to 1 month. For long term storage, please store at -20°C. Try to keep assay plate in a sealed aluminium foil bag and avoid dampness.